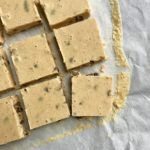 A super simple healthy peanut butter protein fudge made with just 4 ingredients. Make a batch during your meal prep day to have on-hand for a delicious bite-size treat! Combine ingredients until smooth. Line a baking dish with parchment paper. Pour in batter and smooth out with a spatula. Refrigerate for a few hours until firm. Cut into 24 pieces. Store in fridge or freezer. Enjoy!